It is reasonably well known that the North American tectonic plate includes a portion of eastern Siberia. What is often typical in plate tectonic maps is that the actual plate boundary is often drawn with a degree of uncertainty, for example, the map below from the NASA Earth Observatory website is very scant on details of this particular boundary, at times, the plat boundary is referred to as 'diffuse'. This plate boundary is one of the least understood in the world, primarily due to the remoteness of the location meaning that there has not been long term observations of seismicity etc. However, it is not a forgotten boundary and has come under recent scrutiny. The workshop participants describe the plate boundary as transitioning from the ultraslow spreading of the Gakkel Ridge in the Arctic Ocean, across the diffuse extensional zone in the Laptev Sea in the north, into the diffuse transpressional 'Moma Rift'. They describe the uniqueness of the plate boundary as the Euler pole of rotation occurring on or near the plate boundary itself (labelled as NA-EU Pole in the diagram above), which results in the general extensional in the north and compressional complexes in the south. 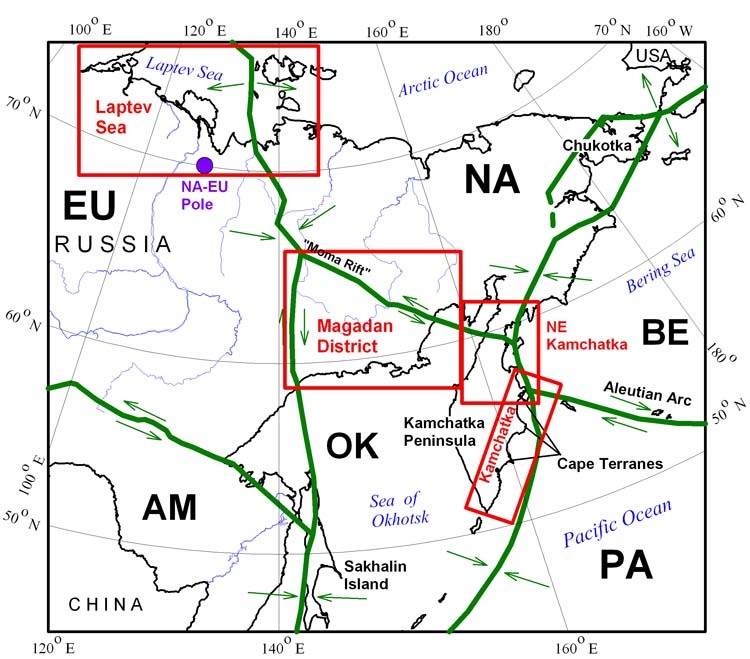 Further research presented in the conference paper Recent geodynamics and evolution of the Moma rift, Northeast Asia (Imaev et al. 2009), suggest that the "Moma Rift" was once an extension of the Gakkel Ridge and was a extensional rift, but as the Pole of rotation moved, it has become transpressional - with an uplift of up to about 4mm/year, representing a convergent section of the boundary. Could glacial melt alter plate tectonic movement?